1. A long introductory essay. 2. A preliminary discussion or introductory essay; especially, to a book or treatise. 3. Etymology: from Greek pro-, "before" plus logein, "to say"; that is, "to say before". 1. A piece of writing at the beginning of a book that introduces the story. 2. The beginning, or introductory passage, of a play, a movie, or a television program which introduces the contents. 3. An actor who speaks introductory lines to a dramatic performance before the main action starts. 4. An event or action that leads to something more important: "The husband's affair was a prologue to the complete breakdown of the couple's marriage." 5. Etymology: from Old French prologue (early 13th century), from Latin prologus, from Greek prologos, "prologue of a play, a speaker of a prologue"; literally, "a speech beforehand"; from pro-. "before" + logos, "discourse, speech" which came from legein, "to speak". 1. To lengthen or to extend in duration or space: "The doctor wanted to prolong the treatment of the patient." 2. To lengthen in time; to cause to be or to last longer: "We prolonged our stay at the seashore." 3. Etymology: from Old French prolonguer (13th century); from Late Latin prolongare, "to prolong, to extend"; from Latin pro-, "forth" plus longus, "long". 1. The consequence of being lengthened in duration. 2. The amount or degree or range to which something extends. 3. A prolonged or extended form. 4. To lengthen in extent, scope, or range. 1. Someone who or that which prolongs, or lengthens, in time or space. 2. Anyone, or anything, that lengthens or protracts. 1. A declaration assuring that one will or will not do something; a vow. 2. Indication of something favorable to come; expectation: "a promise of spring in the air". 3. Indication of future excellence or success: "a player of great promise". 4. To commit oneself by a promise to do or give; to pledge: "left but promised to return". 5. To afford a basis for expecting: "thunderclouds that promise rain". 6. From Latin promissum, "a promise"; past participle of promittere "send forth, foretell, promise" from pro- "before" plus mittere "to put, to send". 1. To raise someone to a more senior job or a higher position or rank; that is, to advance in rank, dignity, position, etc., which is the opposite of demote. 2. To put a person ahead to the next higher stage or grade of a course or series of classes. 3. To encourage the growth and development of something. 4. To publicize a product so that people will buy or rent it; that is, to encourage the sales, acceptance, etc., of (a product); especially, through advertising or other publicity. .
5. To further something by helping to arrange or to introduce it. 6. To move a soccer team or player from a lower to a higher division of a league. 7. In chess, to exchange a pawn for a more powerful piece, usually a queen, when it reaches an opponent's end of the board. 1. Someone who promotes, especially an active supporter or advocate. 2. A financial and publicity organizer; such as, a boxing match or an artistic performance. 3. Anyone who raises money for a financial or commercial undertaking. 4. A person who tries to make a product or service more widely known or more successful. 1. To proclaim or to make something known with a public statement or declaration: The senate leader promulgated a bill that would lower taxes for all citizens. 2. Etymology: from Latin promulgatus, which is derived from pro-, "forward" + -mulgare, which could be related to the verb mulgere, "to milk" or "to extract". 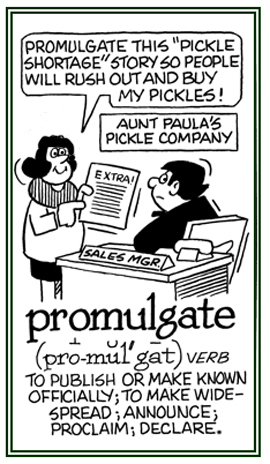 Promulgate especially implies the declaring of a dogma, a doctrine, or a law. 1. A person who officially announces, publishes, or makes something known to the public. 2. An official who formally announces a statute or a decision that is made by a court.